I get a lot of questions about the best image sizes to use when posting photos on social media platforms, in particular Facebook and Instagram, so I thought I’d put together a quick resource about the ideal sizes for these platforms (as of May 2017). 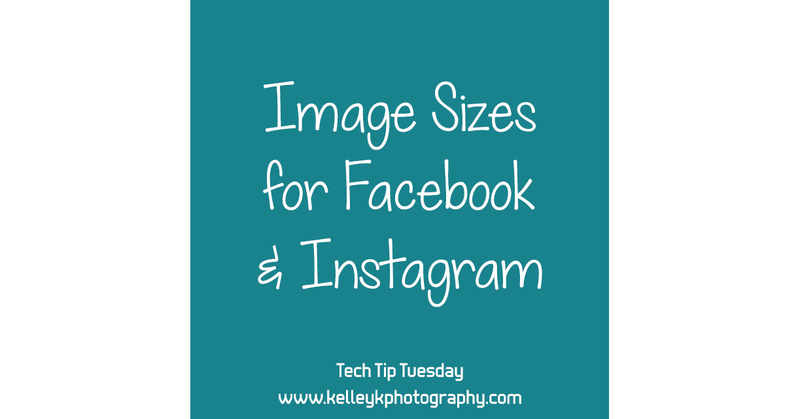 If you want your photos to look their best on social media, you should pay attention to the size of the image you are posting. While you can post images of any size and let the site resize them for you, you may experience unwanted issues like blurry or overly sharpened images. The tips I’m giving will work with any photo editing tools you might use, whether it’s Lightroom, Photoshop, or even an app on your phone. Facebook has a few recommended sizes for images. These sizes are meant to look best after Facebook applies their compression to the images. If image quality is your top priority, 2048 pixels wide is the ideal size. However, if you are concerned about image theft, 2048 pixels wide is a decently high-resolution photo, and you may not want to share something that large online. Note that the recommendation is based on the image width, not the long side. On a landscape-oriented (horizontal) image, the width is the longest side. However, in a portrait-oriented (vertical) image, the height is the longest side. If you save a portrait-oriented image at 2048px wide, it would be significantly taller than 2048px. Facebook also has two smaller recommended sizes — 960px wide or 720px wide. Using these smaller image sizes makes your images less useful for anyone wanting to steal them, because they can’t be enlarged much for print or web use without looking ugly. But they may look small on large monitors, or they may appear very pixelated or blurry on large high-resolution monitors like Retina displays. On my personal Facebook page, I typically save landscape-oriented photos at 2048 pixels wide, as it does look the very best, even on large screens. I typically save portrait-oriented photos at 960 pixels wide, which is still fairly large. On my business Facebook page, I use smaller sizes to reduce the likelihood of image theft, since it is a public page. I typically save landscape-oriented photos at 960 pixels wide, and portrait-oriented images at 720 pixels wide. These sizes make portrait and landscape images roughly similar sizes, depending on the crop ratio of your exported image. When I post image collages, which I almost always do in a landscape orientation, I size them to 2048 pixels wide, since each individual image will be smaller. To give you an idea of the size, the images below are saved at 960px and 720px wide, respectively. I also use quality 80 in Lightroom (equivalent to quality 10 in Photoshop) to reduce the file size further so that Facebook doesn’t do as much compression on the image. Instagram makes sizing images a little easier than Facebook. Instagram doesn’t seem to do such aggressive image compression and sharpening. This means that images tend to look good on Instagram no matter what size they were uploaded at. I know a lot of people who don’t resize specifically for Instagram and I’ve never noticed any issues with their image quality. However, there is a recommended size you can use so that Instagram will not need to resize your photos for you when you post. Instagram used to use 640px wide squares for all images, but back in 2015, they started supporting larger images to improve display quality on high-res devices. Now they allow images up to 1080px wide. This is not 1080px on the long side – it’s 1080px wide. Instagram also started allowing non-square images, so that you can share a horizontal image in the popular 3:2 ratio that many cameras use, or even wider than that if you want (up to 1.91:1). For portrait-oriented images, you can share images up to a 4:5 ratio (like an 8″x10″ photo). This is shorter and wider than portrait-oriented images taken on most cameras, so it will require some cropping either when editing your image or posting to Instagram. Based on these ratios, images that are 1080px wide must be between 566 and 1350 pixels tall. Images will still show as squares in the grid layout on Instagram, so keep in mind what part will show when cropped to a square. You can preview this when posting the image by togging the crop to square icon (in the lower left corner) on and off. When using the new Instagram gallery feature, Instagram only supports square images at this time. That means your images will be cropped when you post them. If you wish you retain the original dimensions, you will need to add color blocks to crop them to a square before adding the image to the Instagram gallery. You can do this in Photoshop or other graphics programs on your computer, or there are a number of smart phone apps designed to do just this, including SquareIt on Android or Whitagram on iOS. While Instagram saves images that are 1080 pixels wide, images display at 600 pixels on the long side when you open individual images at Instagram.com. Although Instagram.com doesn’t display images at 1080px wide, it is easy for people to download the 1080px wide images if they want to. I won’t share how, but I think you should be aware that it is possible to do that. I crop my images in Lightroom, and then resize them on export so that they are 1080px wide and up to 1350px tall. I make sure to crop any portrait images to 4:5 so that they will not be cropped by Instagram and will be exactly 1080×1350 pixels. I use a mix of square images and ones that are cropped to portrait or landscape orientations. The image below is 600x600px, which is the largest an image will display on Instagram.com. However, uploading a larger image will ensure that the image looks good on even large high-resolution displays. The image below may appear blurry or pixelated on high-res Retina monitors because it is saved at 600px wide. What size export do you recommend for Flickr galleries? Great question! Flickr is not as picky as other social media sites, because it’s designed for optimal photo sharing quality. So the recommended size for Flickr really depends on how you are using it. If you want to use it for backing up or sharing print-quality photos, I would export full-resolution photos. If you are just using it to share your work with friends online, I’d use 2048px on the long side. This is what I use for most of my Flickr sharing. Or if you’re sharing your work publicly and are concerned about image theft, you may want to use a smaller size like 1024px on the long side.